I have the DVD-3930 european model. Very strong video capabilities, propably one of the very best DVD players ever. Even worth for professional users. But wath makes it a real star is its audiophile sonic department : equal to 1500 $ CD standalone players (in 2017 !) plus terrific SACD sound. Taught and deep bass, very precise mids go along with neutral, accurate highs. Holographic, harmonic sound for all types of music. Video quality is just excellent, and so are all the surround modes. If you find one in good condition and for a cheap price (originally about 1900 $ in Europe) I would buy it AFTER checking the disc drive (especially with CDs) for a couple of hours. Because some players will have the disc drives (optic part ?) to be changed out as you can read many having had problems with that. Mine still works o.k. (about 98% with CDs and SACDs, 99% DVDs). Switching from CD to SACD track on hybrid discs does not allways function. Otherwise didn't have any inconveniences. Strongly recommended. With a single HDMI cable you can pass everything to the receiver in digital form. Add D-link pass SACD to the receiver without conversion. Alternatively each format can be passed as 5.1 analog or down mixed to 2-channel analog. Bass management is available. Basically a universal disc player. Set up is fairly easy using the GUI and remote. The default setting will work "as is" for a lot of viewers. GUI is though easy to use is virtually required for set up. DVD menus cannot be used from the front panel but require the remote and GUI. Getting the D-link to work with the AVR took two or three readings of the user guides. Once set there is no more problem -- it'd just not immediately obvious. Pricey if all you want is a basic DVD player. Unless you want a universal player with HDMI and D-link, you can get equivalent functionality with a less expensive model. Chosen for HDMI and "Denon-Link". Ability to play nearly every disc format with minimal hassle and especially to pass multichannel digital SACD and DVD-A directly to the receiver. 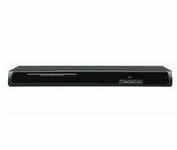 % year older Sony DVD player, early DVD player by RCA.